Grandma always did make the best banana bread. You can too when you use Grandma’s Banana Bread Recipe! Simple and delicious. The recipe I am going to share with you is my grandma’s banana bread recipe. I grew up eating this bread and it is so yum! It is good hot and fresh out of the oven, but it is even better the next day when the banana flavor gets even stronger! I featured this same bread in one of my earlier posts Accordion Rosette Gift Topper. Banana bread makes a great thank you gift! This recipe makes 1 loaf. I like to double it because 1 loaf won’t even last a day around here. Tip: I do not like to eat bananas that have browned, they are too mushy. That is when they are perfect for Banana Bread! I usually only have 1 or 2 bananas that aren’t eaten quick enough and make it to that icky stage. 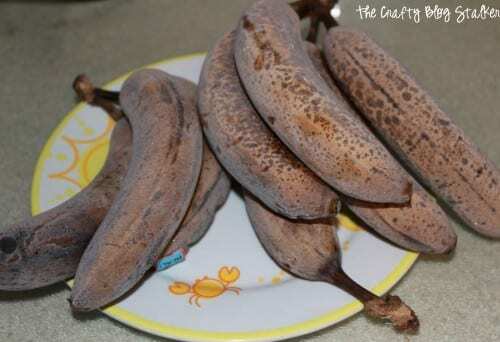 Since 4 bananas are needed for 1 loaf, toss those icky bananas in the freezer. They thaw pretty quickly by leaving them out on the counter. 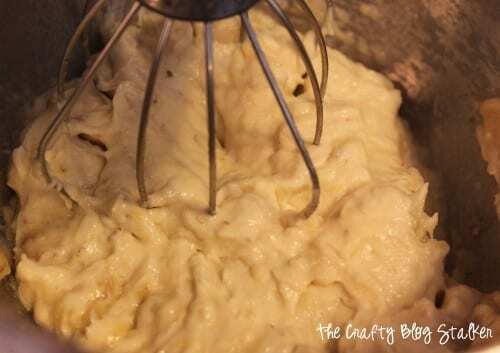 After the bananas have thawed beat them to a liquid using your mixer . I use a Kitchenaid mixer. Add all other ingredients – this picture is missing the flour. Mix all ingredients until well combined. I really like to add the Cup of Chocolate Chips, but that isn’t my hubby’s favorite so I don’t always do it that way, but it sure is tasty! Grease and flour the inside of a loaf pan and bake at 350 for 1 hour or until a toothpick inserted in the middle of the loaf comes out clean. After the bread has cooled, slice to desired thickness and serve. I like it sliced thin with a lot of butter, hubby likes a plain thick slice, and my Mother-in-law likes it toasted. However you like to eat your banana bread, it is going to be delicious! Do you have a favorite recipe that your grandma would make for you? Share and leave a comment below! 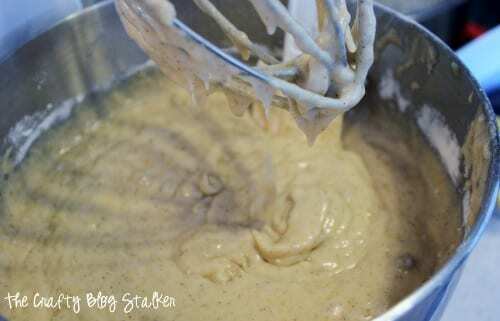 SAVE HOW TO MAKE GRANDMA’S BANANA BREAD RECIPE TO YOUR FAVORITE DESSERT RECIPE PINTEREST BOARD! And let’s be friends on Pinterest so you can see all the delicious recipes I’m pinning! Looks super delicious. I love banana bread and am always buying extra bananas, then telling my family they can’t eat them because they are for the banana bread I want to make. lol Thanks so much for linking up to Creative Thursday this week. I can’t wait to see what you link up next week. Have a wonderful weekend. Yum! I love banana bread. TFS at the Creative Corner Blog Hop. Your rosette is really cute too! Katie this recipe looks yummy! I always have frozen bananas in my freezer as well 🙂 I wonder how long they last in the freezer because I often find some that have been in there a bit too long. LOVE banana bread!! Your recipe sounds great. Thanks for sharing with us at Link It Up Thursday. I love banana bread. Thanks for sharing the recipe. And thanks for sharing at Terrific Tuesday. I LOVE banana bread…and the “growing old” bananas are the best for banana bread :)…thanks for sharing your recipe and linking up with us @ Toot Your Horn Tuesday!! I just used this recipe and tried the first slice about five minutes ago, and it is awesome! Congrats! 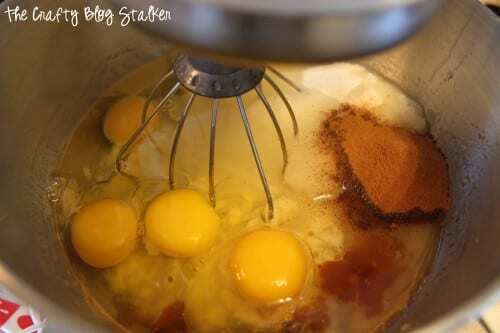 Your recipe was the most popular recipe from the Required Ingredient Recipe link party and was featured today! Banana bread is probably the best type of bread ever made. This recipe looks super simple, which I love, since I’ve got 3 boys under 4 years old. I know, what was I thinking?! So the simpler the better! I love the tip about freezing bananas! I’ll have to give that a try, as I’ve always got funky bananas hanging around here! Anyways, I just published an Easter article on my site about healthier options to put in an Easter basket, and included your banana bread recipe in my list! Here’s the link if you want to check it out! Looking forward to what other tasty recipes I find on your site! Thanks Laura! I’m so glad you like this recipe. Thanks for sharing the link on your own blog. I really appreciate it!